Nicki was brought up on a musical diet of Newfoundland folk and Western classical music. Having discovered the clarinet when she was eight, she broke through the complexities of Brahms and Poulenc, achieving grade 8 with honours when she was 17. Since then she has touched on the genres of klezmer, Bulgarian and Macedonian folk music, and she is now focusing on the makam driven music of Greece and Turkey. 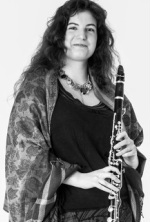 Captivated by the voice of the klarnet and klarino in Turkish and Greek music, it has become her ambition to emulate the sound produced on the clarinet within these styles. Nicki studied music at Southampton University from 2006 - 2009 obtaining a BA degree with first class honours and subsequently studied for a Masters in Middle Eastern music at the School of Oriental and African Studies from 2009 to 2010 achieving distinction. She has performed at many venues in London and across Europe and plays with several bands including Opaz, Dila V. and the Oddbeats, WildEast, and Kourelou. completed a Master's degree in Music Performance at SOAS. Kostas studied Mediterranean percussion in Greece and African Arts at the conservatory of Amsterdam. 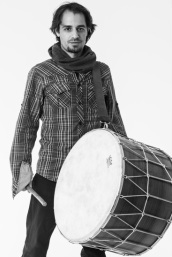 He has also taken worldwide seminars in different percussion styles with well-established musicians, such as Alex Acuna, Cristobal Carrnaga, Javier Campos Martinez, Pedro Pablo Rodriguez Mireles, Sega Sidibe, Ponda O Brayan, Omar Faruk Tekbilek, Petros Kourtis, Fadouba Oulare and Harouna Dembele. Throughout the years he has worked alongside Greek and foreign musicians in a vast scope of performances ranging from theatrical musicals to independent productions. As a consequence Kostas has performed in the most prestigious Concert Halls and Theaters in Greece, Netherlands, Romania, Cyprus, Italy, Austria, Germany and Finland with many other talented performers and musicians; just to name a few: Juno Reactor (UK), JD Walter (NY), Adedeji Adetayo (Nigeria), Joel Soto (Cuba), Giannis Spanos (GR) and Sakis Rouvas (GR). George grew up in Greece. He started taking guitar classes at the age of nine and soon was inspired by classical and rock music. George decided to study for a Bachelor degree on Eastern Mediterranean Traditional Music, where he was influenced by the rhythmic complexity of the Balkans and Middle East, and graduated as a percussionist. 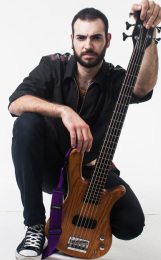 In the meantime, he developed a strong passion for fusion and funk bass. Studying the compositional styles from the Pre-Classic to Romantic years lead him to his Masters degree in Composition and Composition for Media at the University of Sussex between 2009 and 2011. George has performed as a guitarist, bassist, percussionist and pianist in various concerts and events around Europe. He has a keen interest in orchestrations, but especially acapella compositions and arrangements. At the moment, he works as a music teacher in primary education.